Complete hair suit using natural or synthetic fibers (Human, Yak, Kanekalon, or NFT). Hair should be natural colors such as brown, blond, auburn, black, grey, or white (albino). Hair should average at least 6 inches or longer, but 8-10 inch long hair is preferred. Complete coverage is required; no bald spots or exposed skin/undersuit. Faux fur is not allowed, as it is not long enough. No yarn or shag carpet Wookiees. The Rubies Supreme Edition Chewbacca suit is NOT acceptable even with modification. The quality of these materials is inferior to what can be achieved with latch hooking or National Fiber Technology. The hair must maintain a consistent quality/type throughout the suit. Arm length must be proportionate to that of the overall body look. No T-REX Arms. Dark brown, gray, or black gloves should be worn, but are not required if your hands remain hidden by fur. There should be enough overlap between the gloves and the wrists of the hair suit that no skin is exposed. Gloves may be made of leather, vinyl, cloth, or rubber. Claws/nails are encouraged, but not required. Feet must be completely covered with hair except for the bottom and the toes. For stilted Wookiees, toes MUST be visible to create the look of a foot. 3-6” may be required depending on the style of stilt. For those who use Kiss boots, or lifts, a hint of the claws is recommended for OT Chewies and full toes for PT. The same stands for those naturally above 7’ tall. The mask must completely cover the head and neck, without completely obscuring the shape of the shoulders. The eyes, a smooth black nose, and a large jaw/muzzle with flesh tone or brown lips should all be clearly visible. The mask hair should be smooth and well groomed, not bushy, so that the mask’s shape and structure are clear. Beards, mustaches, dreadlocks and other features, as seen in accepted sources, are encouraged. Static masks should not be frozen in a fully opened position. All static mouths should be closed. Although a functioning jaw and/or lip snarl is not required, the skin and lips of any mechanical masks should appear as one piece, rather than a separated jaw and face. This refers only to the mask’s outward appearance, not the underskull. Costumers should be aware that mechanical jaws and lips are complex projects requiring purpose-built components using special materials. They cannot simply be added to an existing latex rubber mask. Consult the costuming resources and fellow Wookiee costumers for advice on this project. Eye makeup (shades of black or brown) should be worn around the eyes and completely cover any exposed skin. Wookiees may wear helmets, minimal body armour, leather bandoliers or aprons, or any item of that nature. 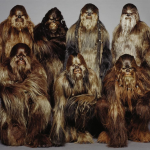 Wookiees are not seen to be wearing clothes in the sense of other humanoid Star Wars characters, such as, shirts, pants, robes, tabards, shoes, or any other article of clothing are unacceptable for approval.